Waterproof material, antibacterial, ergonomic, durable, feel comfortable, and easy to clean. With reflective stripes on the shoulder strap for safety and preventing from cars at night,or foggy days,rainy days. 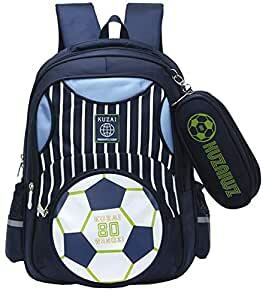 Cool design with soccer printed, great for 5-12 years little boys. Package Includes: 1-Backpack + 1-Pencil Case. 1.Please check the dimensions carefully before purchasing. 2.The real color of the item may be slightly different from the pictures shown on website caused by many factors such as brightness of your monitor and light brightness. I ordered this backpack for my 2nd grader and when it arrived it seems pretty cool. The quality of bag is so good but with in one month the zippers are broken and now my son couldn't use it anymore.